Address Sign with Longitude and Latitude - - personalized coordinates address sign shows the longitude and latitude of your home or business. 10" x 6" rectangle or made to your size requirements**. Perfect for that beach house or mountain cabin. Wall mount or lawn mount***. Made in USA. *** NOTE: Lawn mount requires the purchase of the optional lawn stake. If you decide to order the wall mount sign and a lawn stake, we will ship them to you. However, the stake won't be compatible with the sign you receive because of the hole placement. Available as a one-line address number plaque or a two-line name or business plaque. If you know the coordinates you want, please type them into the corresponding Longitude and Latitude input boxes in the exact format shown in the samples (direction degrees minutes seconds). Otherwise, leave the first two input boxes empty and provide the complete address of your location (number, street, city, state, and zip) in the Complete address input box, and we will determine the correct numbers. 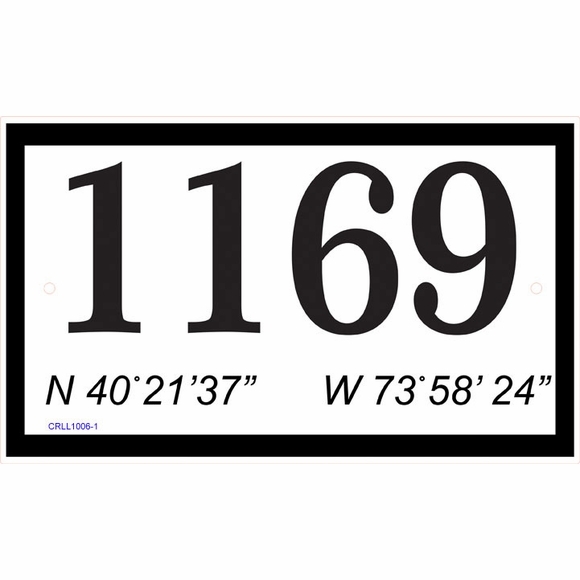 The 1-line address number plaque holds up to four (4) 3" high numbers or letters along with the coordinates. The 2-line name plaque holds up to nine (9) 1.5" characters on Line 1 and sixteen (16) 1" characters on Line 2, the coordinates, and the compass rose as shown in the small image above. Signs include 3/16" diameter fastener holes and stainless screws. NOTE: wall mount and lawn mount versions are similar but not interchangeable! The difference is the placement of the mounting holes when the signs are made. ** Sign not big enough? Not small enough? Need more lines? Need more character spaces? Need vertical orientation? We will supply your address sign anyway you require. Please contact customer service with your specifications for a quotation (customerservice@comforthouse.com).